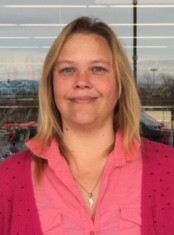 Let’s take a moment to celebrate one of our own, Christa Cash, Horizon Goodwill’s new store manager in Woodstock, Virginia. Born in Fairfax, Virginia and raised in Spotsylvania County, Christa has a passion for competitive baking. When she is not baking in her spare time or managing her store, she has a love for animals and enjoys spending time with her husband of 25 years and their daughter. When asked to share her most memorable moment, Christa stated, “it’s not just one moment, it’s moments. Over the past 5 years I have seen so many acts of kindness and caring.” She is most proud of her team for covering shifts, helping where needed, and working hard every day to achieve their goals. We at Horizon Goodwill are extremely proud of her promotion and success. We look forward to celebrating her growth as a Store Manager, and watching her lead the Woodstock retail team in accomplishing their goals.